Private Desmond Adams died during operations at Normandy on D Day. Sergeant Denis Amato died during operations at Normandy on D Day. Gunner Kenneth Bell died during operations on D Day at Normandy. Marine Robert Brown died during operations at Normandy on D Day. Lieutenant Michael Burness died during operations at Normandy on D Day. His brother 129290 Lt. Arthur Donald Burness also died serving with the Royal Artillery, attd. 661 A.O.P. Sqdn. Royal Air Force. Private Edward Cardozo died on D Day during operations at Normandy. Trooper Eric Cawthray died during operations at Normandy on D Day. Private Roland Coffin died during operations at Normandy in the Chateau d'Amfreville area. Rifleman John Cook died during operations at Normandy on DDay. Marine William Dabbs died during operations at Normandy on D Day. Trooper Frederick Dean died during operations at Normandy on DDay. 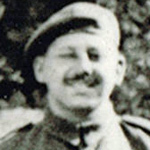 Private Richard Dorsett, 1 troop, died of wounds received on the 12th June during operations in Normandy in the area of Chateau d'Amfreville. No 3 Cdo War Diary June 1944 Appendix E, No.1. ROH in Commando - Memoirs of a Fighting Commando in WW2 by Brig. John Durnford-Slater. Marine John Egan died during operations at Normandy. 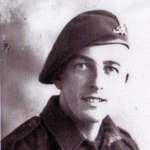 Sergeant Ronald Fielding died during operations at Normandy on D Day. Gunther Max Frank died during operations at Normandy on D Day. He served under an alias of George Mack Franklyn in 3 troop, also known as 'X' troop, of the inter allied commando. Private Edwin Goody died during operations at Normandy on D Day. Private James Groom died during operations at Normandy on DDay. 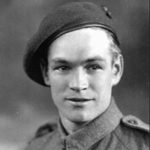 Lance Corporal Albert Guest died during operations at Normandy on DDay. 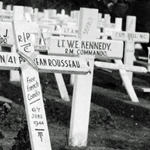 Kurt Gumpertz died during operations in Normandy with No 4 Commando. 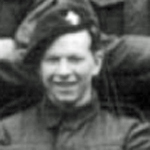 He served in 3 troop, also known as 'X' troop, of the inter allied commando under the alias of Kenneth Graham. 10 Commando, author Ian Dear. Sergeant Ashton Hey died during operations at Normandy on D Day. Gunner Harold Hughes died during operations at Normandy on D Day. Marine Edward Johnson died during operations at Normandy. 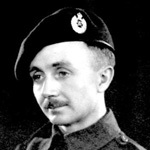 Lieutenant Wallace Kennedy, Intelligence Officer of 45RM Commando , died during operations at Normandy on D Day . 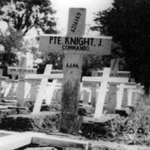 Private John Knight died during operations at Normandy on DDay. Max Lewinsky died in a landing craft with Ernest Weinberger [more...] during operations at Normandy on D Day. 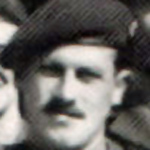 He served in 3 troop, also known as 'X' troop, of the inter allied commando under the alias of Max Laddy, and was one of their medical orderlies. Lance Corporal Brian Mullen died during operations at Normandy on DDay. 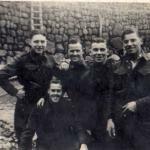 A talented artist and photographer LCpl Mullen had previously taken part in the Lofoten and Dieppe raids. Private Robert Nolan died during operations at Normandy on D Day. Private Robert Ong died during operations at Normandy on D Day. 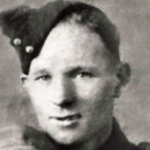 Lance Corporal Roderick Ovenden, 'F' troop, died during operations at Normandy on DDay. He had been with the Commando since at least December 1942 as he is mentioned as Rfn. Ovenden in this document about a Boxing Contest. Lance Corporal William Owen died during operations at Normandy. Private Victor Palmer died during operations at Normandy on DDay. Lance Corporal Joseph Pasquale, a veteran of Dieppe, died when a mortar shell exploded near him during operations at Normandy on DDay. 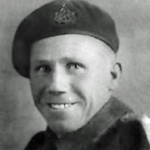 Private William Patmore died during operations at Normandy on DDay. 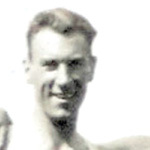 Lieutenant John Pearson died during operations at Normandy. Corporal Arthur Poole died during operations at Normandy on D Day. Signalman Donald Pottas died during operations at Normandy on D Day. Marine Ronald Poultney died during operations at Normandy on D Day. Lance Sergeant George Price died during operations at Normandy. Extract from the No 6 Cdo War Diary for the 10th June. "Place: In the field, Le Plein a.m. - 2 Troop kill 2 snipers with 'K' gun. We are heavily mortared. We answer with our own mortars. 0800 - Enemy attacks, all troops engage. By 1700 hrs all attacks definitely repelled. Suspect enemy got it in the neck. Our own casualties total 16." Lance Corporal Patrick Quinn died during operations at Normandy on DDay. Lance Corporal James Race died during operations at Normandy on DDay. Marine Frederick Reynolds died during operations at Normandy. Private Ian Ridland died during operations at Normandy on DDay. Private James Robb died during operations at Normandy on D Day. Gunner Frank Shaw, 'C' troop, died during operations at Normandy. Lance Sergeant Alexander Sinclair died during operations at Normandy on D Day. 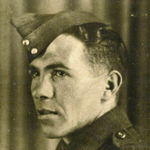 Private Sydney Smallman died during operations at Normandy on DDay. Gunner Fred Smith died of wounds during operations at Normandy on DDay. He received a posthumous MiD for "gallant and distinguished services in Normandy." London Gazettes Supp. 36720, page 4474. Private Harry Sutton died during operations at Normandy on D Day. Marine Philip Trolley died during operations at Normandy on DDay. Private Charles Vernon died during operations at Normandy on D Day. Trooper Jack Wall died during operations at Normandy on D Day. Guardsman John Walters died during operations at Normandy on DDay. Marine Ernest White died during operations on D Day at Normandy. 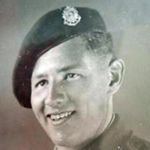 Private Ronald Youngman died during operations at Normandy on DDay. His age above is that shown on the CWGC record, however his family state he was only 19 when he died.